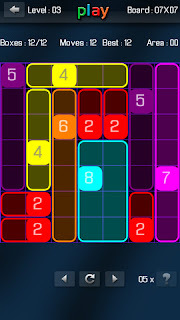 Developer Quote: "In Boxes Free, every number in the board needs a box drawn around it with matching color and area." 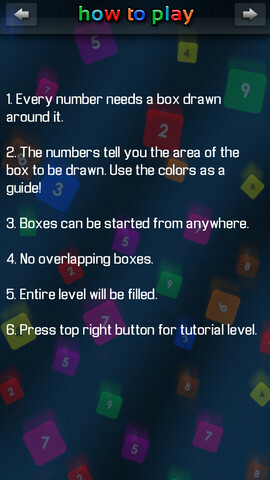 Tap the tutorial button on the top right if you need instructions for Boxes Free. However, I think it's self-explanatory enough where that would not be necessary. Just use the colors as a guide, draw the correct size box around the number with no overlapping boxes, and you will have completed your level. It's fun, and you can play via the Game Center to match your wits against others. There are several in-app purchases which you may want once you are ready to move on to uncharted waters! 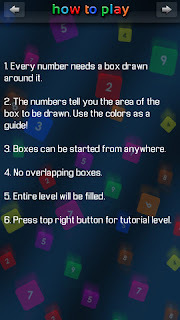 COOL CONCLUSION: Boxes Free combines a bit of math, logic and puzzle to produce an addicting game for the entire family! --iOS/Age Rating: This app requires iOS 4.3 or later. Rated 4+. ~ Also visit our site page Free Apps-Staff Picks Today to see what's been FREE the past few days! Subscribe to Cool iPhone, iPad and iPod Touch Apps by selecting either: E-mail or RSS Reader.. Also follow us on Twitter , Facebook, Google+ and on Pinterest (Cool iPhone Apps), and Instagram (cooliphoneapps1). If you share this post, please link back to us.